There’s so much that’s been happening in the NBA in the past few days. That doesn’t even include everything that’s happened in the past few hours. The trade deadline insanity started early this year with big trades involving several All-Stars. Bombs have been dropped while trade reports have been emptied at a dizzying clip. Kristaps Porzingis is in Dallas. Tobias Harris and Boban Marjanovic are still together (thankfully), but now in Philly. Anthony Davis still isn’t a Laker, yet. The Kings have been one of the biggest surprises this season. Their young core has really panned out and are playing well together. They’ve figured out that the key to winning in the modern NBA starts with a dynamic point guard (De’Aaron Fox). Surround him with shooting (Buddy Hield, Bogdan Bogdanovic, Nemanja Bjelica) and rim protecting big men (Willy Cauley-Stein) and you can really be competitive. The only thing missing from the Kings’ roster is a wing that can create his own offense. Today, Sacramento tried to address that need by trading for Harrison Barnes. Shams Charania of The Athletic broke the news while ESPN’s Adrian Wojnarowski added the details of the trade. This trade makes the intention of both teams clear. The Kings are hoping Barnes can not only push them into Playoff contention this year. But they’re also hoping that he can be their first major free agent signing in a long time. Sacramento signed Barnes not only for this year but it seems like they’re looking at the long haul. If Barnes sticks around and the rest of the young Kings can gel with the new addition, that makes Sacramento a threat in the West for years to come depending on how everyone develops. Maybe Vlade Divac does know what he’s doing? As for the Mavericks, this deal means that they’re done playing for the eighth seed with mid-level talent. They’re going all-in with Luka Doncic and Porzingis as their franchise players moving forward. But it’s not limited to just those two. They opened up $30 million in cap space to make another move at a major free agent this summer. 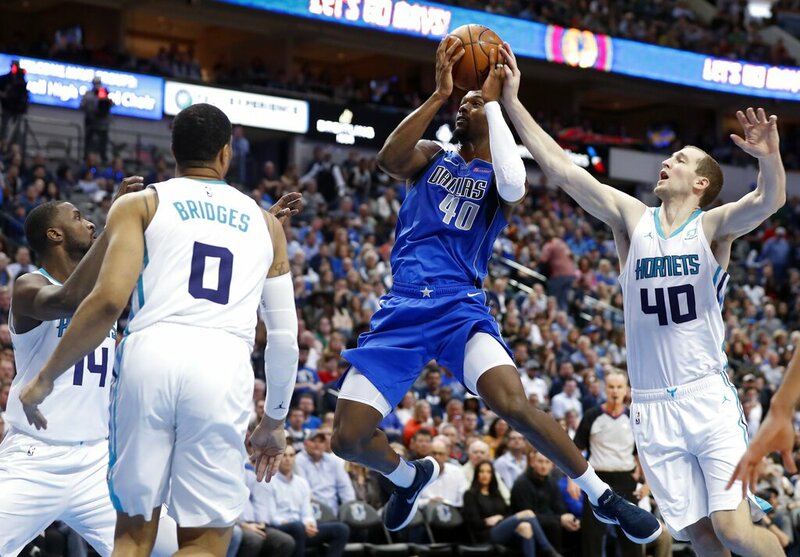 In two moves the Mavericks quickly rebuilt themselves into a possible Playoff contender next year and have paved the way for their team post Dirk Nowitzki. The timing of the Harrison Barnes trade was one of the most unfortunate things that could ever play out publicly. The trade was reported to the public in the middle of the Mavs-Hornets game. Barnes wasn’t held out of the game so during the game, when the report broke out, the broadcast crew had no choice but to address the issue. Thus, the saddest on-air graphic was born. After the game, LeBron James, weighed in on the unfortunate situation. This could be a play by LeBron to protect Anthony Davis and his very public trade request. Or it could be the King just protecting a fellow player. Most likely it’s the former, because Davis liked LeBron’s post. See? Even in a trade that didn’t involve them, James and Davis found a way to make it about them. After the report of John Wall going down with an Achilles tendon tear, the Wizards decided to change the course of the franchise. Before the Wall’s awful injury, the Wizards were fighting for a Playoff spot led by Bradley Beal and the cobbled up roster of veterans. After Wall’s injury, the Wizards had a fire sale. First, they offloaded Otto Porter and the remaining $55 million in his contract to the Chicago Bulls for Jabari Parker and Bobby Portis. This move helps ease the luxury tax burden for the Wizards. They acquire young, flawed talent on the cheap from the Bulls. As for the Chicago, they get a solid two-way player in Porter. He forms a promising wing combination with Zach Lavine. After trading Porter, Washington made another move to trade away one of their starters. They ship Markieff Morris to the Pelicans to get Wesley Johnson. This was another move to get under the tax line for the Wizards. As for the Pels, they take on a high salary with a 2023 second round pick attached. The Wizards aren’t the only ones making cost-cutting moves. Miami dumps point guard Tyler Johnson for a slightly cheaper contract. They dump nearly $40 million in salary owed for the next two years to the PG-hungry Suns. Johnson can take on the vacant starting point guard position for the lottery-bound team. As for the Heat, they take on only $15 million guaranteed next year for Anderson. A buy-out can happen but if it doesn’t at least they end up with some savings. The current trend in the league is to hoard lottery “busts” and give them a fresh start. The Knicks and Nets are reaping the benefits from this strategy. The Bucks and Pistons are trying the same strategy out. They swapped lottery picks stuck in the end of their respective benches. The Bucks sent the 10th pick in 2016 Thon Maker to the Pistons for Stanley Johnson, the 8th pick in the 2015 draft. The Pistons get additional length and a legitimate back-up center. The Bucks acquire another switch-y guard they can play alongside their wing corps. The trade deadline madness started a few days ago when the Thunder sent some TLC to the Bulls. This move is contingent on the condition that Chicago finally waives Carmelo Anthony. A day after that, the Blazers made a move to get Rodney Hood from the Cavaliers. They sent Cleveland Nik Satuskas and Wade Baldwin (see below.). The more important haul for Cleveland are the two picks from the Blazers. After that, there was the Porzingis deal and the Harris deal. The Sixers made another minor trade, acquiring Malachi Richardson, Emir Preldzic and a future second round pick for cash. The Lakers made a trade, Just not the trade everyone had in mind. They get a ready-to-play now player in Bullock in exchange for a young shooter that needs to be developed. The Rockets, Kings and Cavs all went in on a deal that helped their respective causes. The Rockets add a shooter and a defensive wing, the Kings get another young guard and the Cavs get more picks. Cleveland is trading Alec Burks and a second round pick to Sacramento in exchange for Iman Shumpert as part of a 3-team package that includes Houston, league sources tell Yahoo Sports. There’s still five hours left until the trade deadline. A lot more could happen. Or the worst is now over.